There is a new generation of go-karts that are breaking ground. They are futuristic, designed with sleek, lightweight materials like carbon fiber, sensor-infused for quick navigation, precision-assembled, and compact so they can fit into the trunk of a car! One of the highlights of our Summer term, students will then test drive these hand-built vehicles in an exciting studio finale race that is sure to draw a crowd! 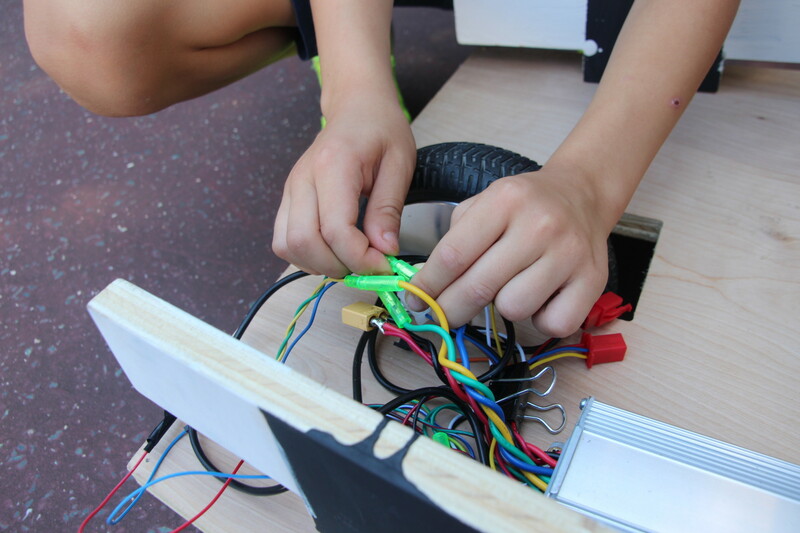 In this studio, you’ll be working with your peers to design, engineer, and build an E-Go-Kart, or electric go-kart, that will navigate on the roadways of our Nu Grand Prix! As a team, you’ll work on the design of all the elements: chasi, exterior shell, interior cabin, steering apparatus, onboard display, and any other custom features that you can imagine. The style is up to you: futuristic, sci-fi steampunk, fantastical, vintage, geometric, minimalist, or modern-chic. You’ll also use a variety of sensors, such as ultrasonic sensors, color detecting cameras, and pressure sensors, to navigate the course with ease. You’ll be drifting across the Nu Grand Prix in style!